Canon Rauscher writes of his experiences from his early years growing up in Highlands, New Jersey to his retirement after 40 years of ministry. Throughout his life many serious interests and pursuits included not only his Christian path but also his decades of studies in psychic research, parapsychology, magic, and all phases of the supernatural. He writes of his views on prayer, healing, parish life, magicians, Spiritualism, mediums, ghosts, mysticism, the occult, and fraud � with insights on numerous personalities from Arthur Ford, Eileen Garrett, Jeane Dixon to astronaut Edgar Mitchell. A series of chapters covers magicians in his life, escape artists, ventriloquists, fakirs, and practitioners of mind control. He includes a history of the spirit cabinet, both off and on the stage. He profiles such luminaries as Walter B. Gibson, John Calvert, and many others. He discusses magicians and theology, performance in magic and religion, mysticism, religious awe, Masonry, magical wonder, and bizarre magic. As a former rector he presents his views on many aspects of parish life, including drama in the Episcopal Church, murder in the parish, and the demands of parochial life. The book contains 74 chapters in sections designated as: In The Beginning � The Formative Years, Psychic Adventures, Profiles and Encounters, Intriguing Personalities, A World Apart, Varied Perspectives, Religion and the Supernatural, Magic in My Life, Magic and Religion, and A Rector Reflects. Religion, Magic, and the Supernatural is an overview of Rauscher�s years as a priest, as a pastor, and as a researcher. The book is Christian in its perspective, covering many controversial subjects. Rauscher aims to show that life is a pilgrimage with many facets, side roads, intriguing personalities, and offbeat interests. For forty years, Canon William V. Rauscher has been a leading Christian parapsychologist in America, and also a member of the Churches� Fellowship for Psychical and Spiritual Studies (CFPSS) in England. This ought to make him a national treasure for the Episcopal Church there, similar to Canon Michael Perry of Durham, who was awarded a Lambeth doctorate by the Archbishop of Canterbury specifically for his work in this field... In fact it makes him marginalised. There is nothing like CFPSS in the States. Spiritual Frontiers Fellowship, which began with this example, faded into the New Age. There is no real equivalent to the London Society for Psychical Research either, as the American SPR is now also a wraith. Rauscher was however encouraged in his early investigations by Eileen Garrett and the Parapsychology Foundation in New York, who made it possible for him to travel to meet European psychical researchers. Another deep influence was the troubled medium Arthur Ford, mentor to the SFF pioneers. So why is Rauscher significant? He was president of SFF when it had 6000 members in the late 1960s, and knew many of the mediums, healers and researchers then active. One can only compare his wide acquaintance with that of Maurice Barbanell here - and he knew him too. Rauscher�s attitude to the paranormal is critical but not negative .He is an experienced stage magician, and writer on the history of magic. Again, it is difficult for magicians, accustomed as they are to deception, to avoid the hubris of rejecting psi. But Rauscher is among a surprising number who have accepted the reality of some phenomena. He is also one of the few psychical researchers proficient in magic. If the best understanding of the puzzles of mediumship comes from observing its stars, then Rauscher�s long acquaintance with Ford qualifies him. He has the unusual distinction of collaborating in one of the most profound mediumistic biographies (�Arthur Ford: the man who talked with the dead�) and also in a shocking exposure of Spiritualist fraud ( � The Psychic Mafia.� ) . From 1957 to retirement in 1996, Rauscher was in parish ministry. This is important. Even the most dramatic paranormal manifestations which he witnessed had as background the supernatural routine of the church�s year. Rauscher did not wander off to India, start his own religion, or promote heresy. He demonstrated stability, ministered to the people, amassed a considerable library which is already a boon to scholars, and wrote books ranging from a pastoral treatment of suicide (informed by awareness of psychic realms) to an essential monograph on the Houdini test message claimed by Ford. Rauscher�s recent books have been issued through his own Mystic Light Press. The present work is the most substantial of these, which are physically characterised by a high standard of production and numerous illustrations. The chapters deal with his many- faceted life as a priest, psychical researcher and magician, and recall some of the outstanding sensitives and scholars whom he knew. Many of the personalities are American, nationally known but unfamiliar to a British audience. The chapters on Spiritual Frontiers Fellowship, especially ch. 7 are important contributions to the (as yet unwritten) history of this once influential body. Why did it fail, the historian, will wonder, when its UK equivalent succeeded? Geography played a part, North America being so vast, as did religious pluralism. In the absence of creedal bars, anyone could join SFF, and move it away from its original mission to the Churches. Other problems centred on Arthur Ford, whose enigma is further explored in this book. While he did not found SFF or control SFF, he did have an inspirational role, some way between that of Madame Blavatsky in the Theosophical Society and Martin Israel in the 1980s CFPSS. Canon Rauscher explains �It is a fitting way to conclude this journey with the cross as my guide, because it is in Christ that we find the meaning of the cross and hold it high in all our endeavors. At least that has been my motivation in all my pathways of Religion, Magic, and the Supernatural� (p.837). Because of the light it throws on these pathways this book should not only be in big psychic libraries, but also read by all who are concerned with the wider implications of the paranormal. "This is a most formidable and invaluable contribution." "Extraordinary...Religion, Magic, and the Supernatural...such rich information and commentary belong, I think in every magic library." "Religion, Magic and the Supernatural...Because of the light it throws on these pathways this book should not only be in big psychic libraries, but also read by all who are concerned with the wider implications of the paranormal." Leslie Price, former Society for Psychical Research librarian of London and founder of a 10.000 word monthly Newsletter called "Psypioneer". "What a fascinating book! 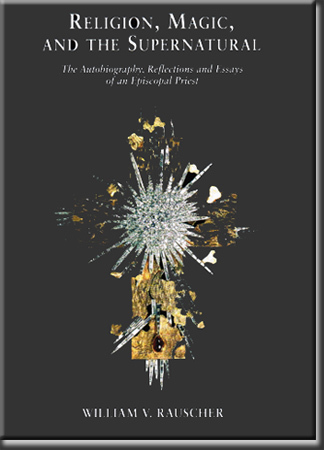 Now retired from his duties as an Episcopal priest, the Reverend Canon William Rauscher has consolidated the themes and concerns of many of his previous books, with plenty of additional material, into what is obviously his magnum opus. In addition to his pastoral duties, Rauscher has devoted his life to a study of mystery in the pulpit, the seance room, and on stage. Much of this giant volume of over 850 pages with hundreds of illustrations (many previously unpublished) is devoted to the history of magic and magicians as well as overlapping fields such as spiritualism, the paranormal, spook shows, escapology, and even ventriloquism. One of the most interesting of the book's 74 chapters examines, in depth, the spirit cabinet detailing many master magicians presentations and patter for this classic effect. I cannon imagine that anyone seriously interested in the history of magic will not find plenty of things of interest in this very big book."